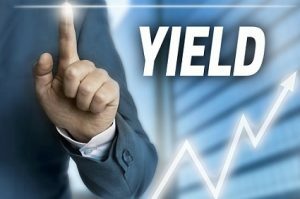 Earnings season is in full swing, with a large portion of the high yield stock universe reporting in the first half of August. Predicting what will happen with individual company earnings is a tough sport and guessing how share prices will react is more like wagering on sports events. However, earnings is the time when a company can show that the market price of a stock is far out of line with the business fundamentals. I seem to always have a handful of companies on my watch list where I believe the underlying business fundamentals are much stronger than the current stock market value indicates. These stocks may be down for a variety of reasons such as a one time bad earnings report, or a misperception of the company’s growth potential. Here are three stocks that could move up nicely after hopefully positive earnings reports. 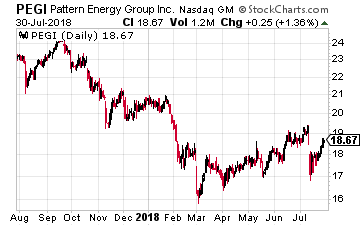 Year-to-date Pattern Energy Group Inc. (Nasdaq: PEGI) is down 13.6%. The decline has been due to the company coming up short in distributable cash flow and not increasing the quarterly dividend for the past two quarters. Pattern Energy has continued its growth strategy of acquiring renewable energy generation assets. Early in 2018, the company acquired five wind and solar power assets in Japan, its first move into that country. A positive quarterly earnings report combined with a dividend increase could propel the stock from the current $18.67 price into the low $20’s. 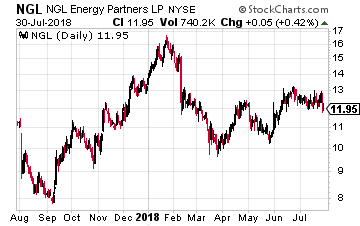 NGL Energy Partners LP (NYSE: NGL) is a diversified energy infrastructure services company that has had trouble getting its different business sectors to all operate positively. Each quarter there is one or two sectors out of the five that disappoints and keeps NGL from hitting its previously issued guidance. In July, NGL reported that it had sold its seasonably cyclical and weather dependent retail propane business. This move should bring more stability to future results. It may not bet this quarter (it could be), but at some point NGL will report a three month stretch of very good results and the current $11.90 value could quickly top $15. 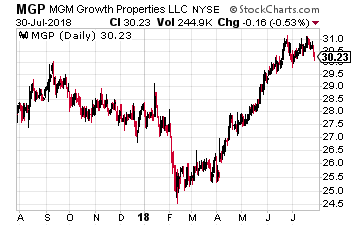 It is my opinion that the stock market has yet to perceive the long term growth prospects of MGM Growth Properties LLC (NYSE: MGP). This casino owning REIT has revenues strongly guaranteed by a master lease with MGM Resorts International (NYSE: MGM). MGP has made two accretive acquisitions in the last two months. The dividend should grow by 10% per year for at least the next two years. A REIT of this quality should yield less than 5%. To get there the share price would need to climb from the current $30.20 up to $34.40. I expect a very good Q2 earnings report, which will trigger share price gains. Thomas is reaping huge cash benefits following my shocking income plan. It’s such a powerful strategy that it could pay all your bills starting as early as next month. The next cash payout is just days away and could vanish if you don’t start this investment plan now. To see how Thomas banked $75,000 with my strategy – and how you could too – just click here.